Beth Ann & Jessica's Helpful Savings: Get $10 to Open Sky and check out their shops by celebrities! Get $10 to Open Sky and check out their shops by celebrities! 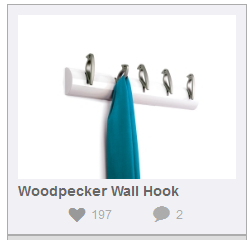 Woodpecker Wall Hook is $40. Very cute and would make a great gift! Join Open Sky and get a $10 Credit from me! .99cent Unbroken Album by Demi Lovato on Amazon! Free John Frieda Sample Pack! Sundance Kitchen Cart just $199.99 from Woot! Amazon Toy Sale.. Up to 50% off Select Toys! Phil Collins: Hits for 99 cents on Amazon! The North Face Jacket 70% off from 6pm! !